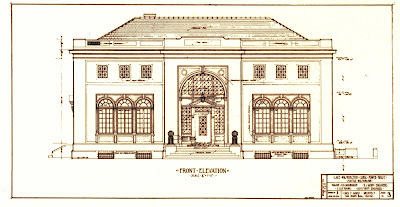 An original elevation drawing of the Administration Building by Carl F. Gould. 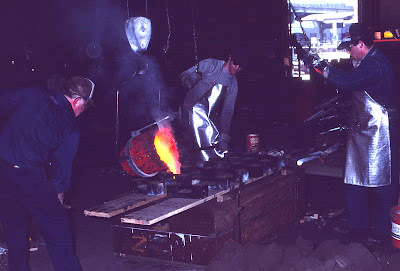 The pouring of the molten bronze into molds for the plaque is shown above. Working from Bebb & Gould’s original drawing, and assisted by artist Gary Westwood and Mastermark engravers, Peterson Pattern Works, a local foundry, fashioned the plaque. 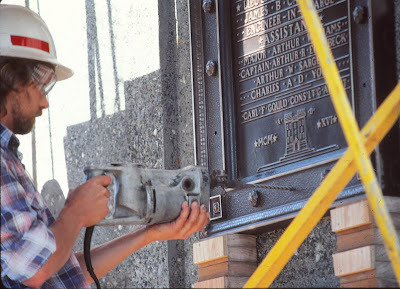 Because of the size and complexity of the plaque, it was cast in three pieces then welded together. 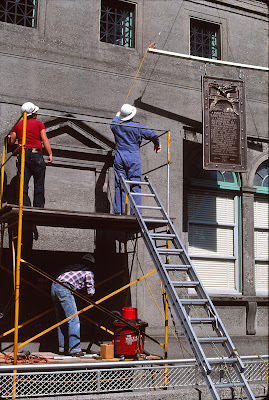 The finished plaque, which weighs about 425 pounds, is attached to the building by eight high strength bolts. The Eagle, emblem of the United States, used by the Corps of Engineers in its Coat-of-Arms. The French term “Essayons” which is the motto of the Corps and means “let us try”. The Castle, the symbol of the Corps of Engineers since 1839. Moving the plaque into place. The Plaque also identifies five Corps of Engineers employees who were instrumental in designing and building the Chittenden Locks, including Colonel James B. Cavanaugh, who was responsible for all aspects of the locks' construction. At the bottom of the plaque is the name of the Consulting Architect for the locks campus buildings and designer of the plaque, Carl F. Gould, a very influential architect in the Northwest. Gould founded the University of Washington School of Architecture in 1914 and designed 19 buildings on the main University of Washington campus, including Suzzallo Library. He also designed many other notable buildings in Seattle, including the original Seattle Art Museum in Volunteer Park and the Montlake Bridge. Attaching to the building wall with bolts.